Dutch football legend Johan Cruijff died at the end of last month at the age of 68. A number of initiatives are underway to commemorate the life of the man credited with pioneering the Dutch system of ‘total football’. In the meantime, here are 14 facts about the world’s most famous number 14. 1 Johan Cruijff joined the Ajax academy when he was 10 but initially preferred to play… baseball. Fortunately wiser heads convinced him to opt for a footballing career at Ajax some five years later. 3 Servaas (Faas) Wilkes, nicknamed Il Tulipano Volante (the Flying Tulip), was Cruijff’s idol. Born in 1923, he was a mean dribbler and, according to many, a pleasure to watch. Wilkes was the first player to say goodbye to Dutch amateur football and go abroad to play for money. In 1949 he went to Italy where he played for Inter Milan. However, it cost him his place in the national team which at that time was also amateurs only. 4 Like Wilkes, Cruijff was convinced that his talent was worth a lot of money and he proved himself an astute negotiator. One of the first to sign a full professional contract with Ajax at 18, he bargained for, and got, four times the amount the club had in mind. 5 In the summer of 1973, having proved himself to be one of the best players in Europe, Cruijff joined Barcelona for six million guilders, a record fee at the time. Cruijff’s subsequent role in Catalan society was a political as well as a sporting one. Real Madrid represented the harsh rule of dictator Franco over the Catalans and when Barcelona became Liga champions their delight knew no bounds. When Cruijff named his son Jordi, after the Catalan patron saint, the presiding franquista civil servant refused to enter the name but got nowhere with Cruijff and Jordi it was. It earned him even more respect from the Catalans. 7 Johan’s wife of 48 years, Danny Cruijff, was famous for her sense of style. Perhaps she was the deciding influence when Cruijff agreed to play two games with Paris Saint-Germain in 1975, and whose president happened to be fashion designer Daniel Hechter. 8 In 1977, Cruijff and his family became the victims of an armed attacker who forced his way into his flat in Barcelona. According to newspaper AD, the man, a labourer from Rotterdam, drove to Barcelona buying a sawn-off shot gun on the way. He forced Cruijff and his wife Danny to lie on the floor, bound Cruijff– who asked with admirable and typical sang-froid for the rope not to be tied too tightly because he’d just had an operation (which wasn’t true) – and held a gun to the footballer’s head. Danny made a dash for the door and when her screams alerted neighbours the attacker fled, dropping his gun. After some fisticuffs with other residents he was handed over to the police and spent a couple of years in prison. Later Cruijff said the attempted kidnap was the reason he decided not to go to the World Cup in Argentina in 1978. 9 Leicester City (current surprise table-toppers in the Premier League) almost signed Cruijff in 1981. Johan was reportedly keen on joining up with manager Jock Wallace at Leicester’s Filbert Street ground but, after three weeks of talks, signed for Spanish club Levante instead. 10 Cruijff returned to Ajax for a second spell but was refused a new contract in 1983. With characteristic contrariness he left to play for arch rival Feyenoord – and won the Eredivisie for them for the first time in a decade. 11 The Dutch national team never lost a match in which Cruijff scored. Johan knotched up 33 goals in 48 appearances for Oranje. 12 Cruijff liked Norman churches. The inhabitants of a certain Cornwall village remember it well. One evening a figure in a mac, accompanied by a blonde woman, entered the village pub. ‘My God, that’s Johan Cruijff!’ one of the men drinking at the bar said, almost dropping his pint. ‘Don’t be daft’, said his friend. But it was indeed Johan, doing a tour of Norman churches in the area. The following day, a beaming crowd bore Johan and Danny off to the village’s Norman church which was specially opened for them. 13 In 2010, the International Astronomical Union (IUA) named a planetoid after Cruijff. ‘He wasn’t only a great football player, he also helps others with his foundation. And that is why he is the first Dutch sports champion to shine in the sky,’ it was said at the time. The number of the planet is 14282; number 140014 had already been taken. Planet Cruijff is circling at around 432 million kilometres from the sun in the space between Mars and Jupiter and has a diameter of around 9 kilometres, or the length of 90 football pitches (approximately). 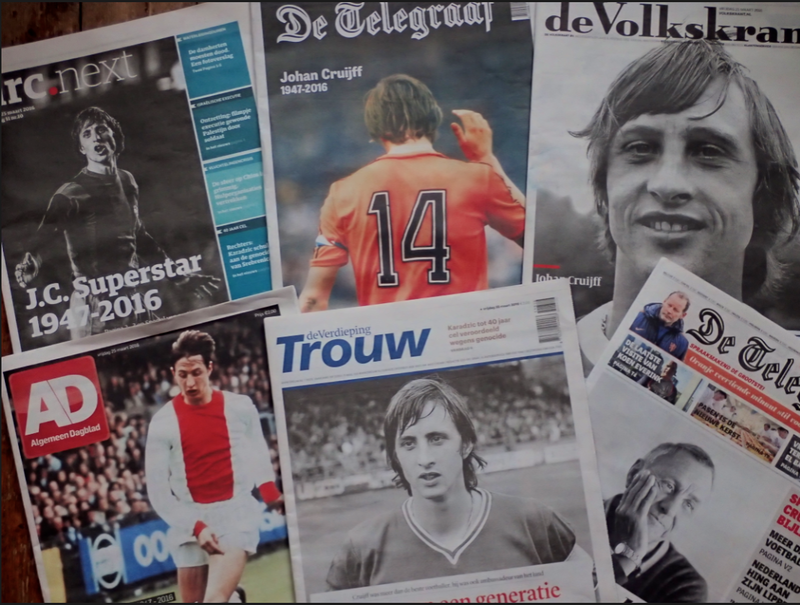 14 Cruijff, in true bolshy form, refused to conform to the rules from a young age: it had to be number 14 for him despite the Dutch authorities demanding he pick a number, any number, between 1 and 11. In 1974, ahead of the World Cup, a competition in which the Netherlands were beaten finalists, Cruijff refused to go along with plans which insisted numbers be decided by alphabetical order. Aptly enough he would have been number 1. If you look closely at the match photos you’ll also see that his specially-tailored Adidas (Oranje’s sponsors) strip (shirt, shorts and socks) has only two stripes instead of the three worn by the rest of the team.